Off the top, you need to know this is full of spoilers. Avert your gaze unless you want'em. Wave the sonic screwdriver around and solve everything at the last moment takes care of menace that were a legend to the Gallifreyans? That's a bit too easy, isn't it? Apart from the relative ease with which the threat was dispatched, I enjoyed this one more than I thought I would from the trailers. Having the Doctor go bonkers while housebound was entertaining and felt like acknowledgment that my concern the episode would feel small and claustrophobic was noted and would addressed by hyperkinetic waiting. Zygons under the Savoy, mentioned as an aside during pop out from the Pond's daily life, that's great stuff. I love when we see snippets of adventures that aren't shown. 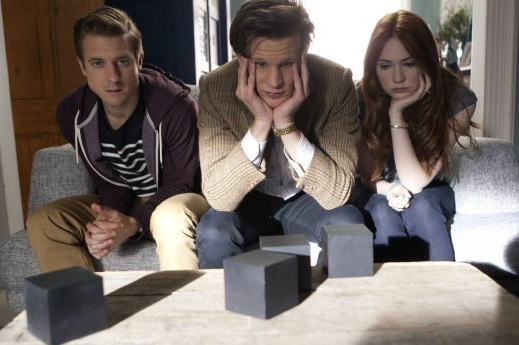 It's always bothered me that 9's regeneration was so short, one adventure to the next with no time away from Rose, and then he's gone and we basically saw it all. With 10 (Rose and the Doctor dashing through the streets of London on an adventure we knew nothing about) and now with 11 we get these mad asides that show we're seeing glimpses of a larger universe, and there are whole other stories we're missing out on: adventures with River, the Doctor traveling alone between spells with the Ponds. Matt Smith even looks a little older, doesn't he? Less smooth-faced these days; he looks more experienced. Brian, Rory's dad, is a welcome sight again this week. He would make a great companion. For an episode about a year of waiting for something to happen, then a third of the world having heart attacks and being remote defibrillated in the span of about an hour in story time, this episode delivered a lot of satisfying moments, making it more than just set up for next week's ... death of the Ponds?! Well, let's hope the teaser didn't show them jumping off a skyscraper to their deaths and that was just ... well, a tease. Just flicked over to Sepinwall and I see he's got a very similar reaction to mine, though he's seems to have enjoyed it slightly less. The AV Club has a review up as well. Again, I think we're all reacting in roughly the same fashion.